Living abundantly, celebrating faith and family. How about starting 2013 with something delicious from the oven? I cannot think of a nicer way to start the new year than this tasty treat for breakfast. We just returned from celebrating Christmas in Texas with my parents, siblings, nieces, and nephews. We saw old friends and I hugged the neck of my name sake, Nana Ruth. (My middle name is Ruth.) It was a good visit. I wanted to make something special for our Christmas morning. So, I made this Cinnamon Baked French Toast. It was wonderful! I am very happy I came across the recipe on Pinterest! As always, there is so much goodness that can be found on that site!! I have the recipe bookmarked onto my Temping Breakfast Recipes Board. Since Christmas is over, maybe you would like to make this for the new year? 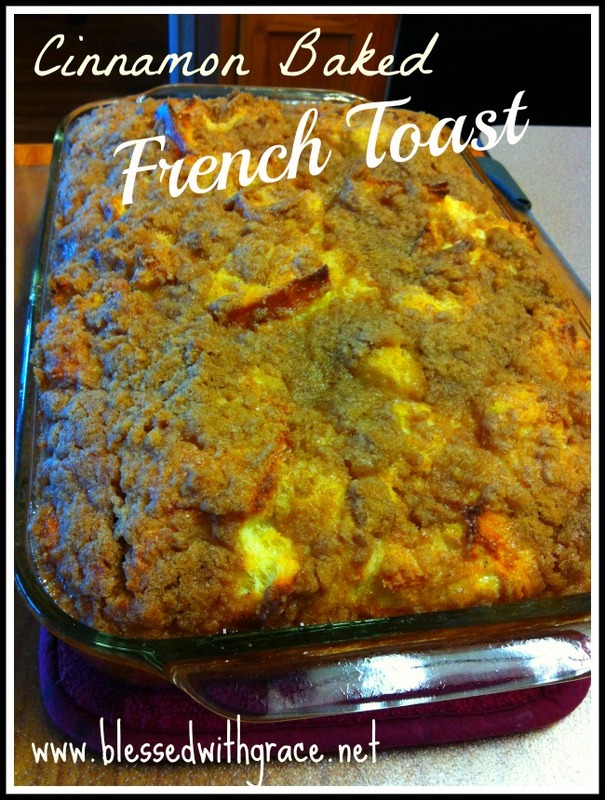 The recipe came from Lovin’ From the Oven blog. She said it was adapted from a Pioneer Woman recipe. Grease a 9 x 13 inch pan. Tear the bread into chunks and place them in the greased pan. Mix together eggs, milk, cream, sugar, and vanilla. Pour the mixture evenly over the bread. Cover and refrigerate overnight. In another bowl, mix together the flour, brown sugar, cinnamon, and salt. Add the butter and mix until the batter comes somewhat together, like little pebbles. Store in a plastic bag in the fridge. In the morning – Preheat the oven to 350 degrees. Take your pan with the soaking bread out of the fridge and sprinkle crumb mixture on top. Serve warm with maple syrup and butter, if desired. Your French Toast looks awesome! Wishing you and your family the best in 2013. It’s been awhile, glad I had something to link; thanks for hosting! That recipe looks good! Too bad I couldn’t get my hubby to throw it in the oven before he left for work. Then we could all wake up to a ready breakfast! 🙂 Thanks for hosting. What are you reading and is it changing your heart?